According to a government source in Jerusalem, one senior American official who took part in the discussions said he did not believe the Israeli prime minister would present a recalcitrant position on the Palestinian issue in Washington. \”Netanyahu will not risk simultaneous conflict with the United States, the Western countries and the moderate Arab states,\” the official predicted. Netanyahu\’s advisers – attorney Yitzhak Molcho, National Security Council head Uzi Arad and public relations chief Ron Dermer – will return Friday from preparatory talks in the U.S. capital. 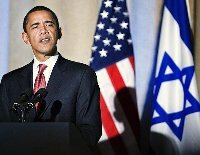 The advisors have also been working on Netanyahu\’s remarks at the press conference with Obama, with the goal of avoiding any public discord between the two leaders over the issue of a Palestinian state. In particular, they are preparing possible responses to questions Netanyahu might be asked on the two-state solution, construction in the settlements, the Arab peace initiative and illegal outposts. Thursday, Netanyahu met in Amman with Jordan\’s King Abdullah, and the statements published by both sides after the meeting revealed substantive disagreements over the Palestinian issue. The statement issued by the king\’s bureau said Abdullah expects Netanyahu\’s government to declare its commitment to a two-state solution and the Arab peace initiative. The king also said that the establishment of a Palestinian state, an Israeli withdrawal from all occupied territories in keeping with UN resolutions, and acceptance of the Arab peace initiative were necessary conditions for peace in the Middle East. Abdullah retorted that talk of economic steps without diplomatic progress toward an independent Palestinian state was unacceptable and would lead to further crisis. Netanyahu countered that economic development of the Palestinian Authority would not come at the expense of the diplomatic process. Abdullah raised the issue of settlements at the meeting, as well as construction in East Jerusalem. He also called for a halt to archaeological excavations in East Jerusalem, terming them unilateral steps that endangered the city\’s holy sites and were intended to change its character.